Your kitchen and cabinets are part of your home, not theirs. 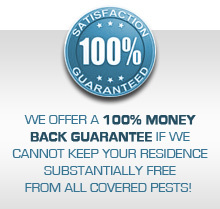 Sovereign Pest Control has affordable solutions to get rid of all types of pantry pests. It’s time to stop letting them demolish your food. Take control now by calling Sovereign Pest Control at 866-430-9801. By scheduling an appointment today with a Pest Control specialist, you are one step closer to a pantry pest service environment free of pests. Following our effective, two-step process, you’ll have your kitchen back in no time! In addition, don’t forget to visit our Specialty Services (Mosquito Control, Outdoor Party Service, Bee Nest Removal, Fly Preventative, Pantry Pest Service, Cicada Killer Control and Stink Bugs & Box Elder Bugs). Be sure to check out our discounts on Specialty Service Options and Current Specials. Pantry pest, typically come from flour, meal, cereals, pasta and grains. Check all items to see if you can locate the source and remove. Seal any open items in sealed containers. Remove all items from the pantry until 2-4 hours after treatment. Anything infested needs to be discarded.